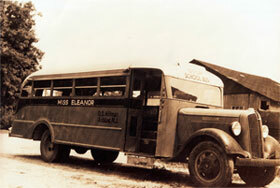 Hillman’s Bus Service was established in 1924 by Oscar Hillman Sr. in South Jersey. As you can imagine, the area has changed over the last 85 years from a rural, farming community, to the hustle and bustle that we know today. Our company has been owned and operated by the Hillmans over the history of the firm. The family has been raised in this community, attended the local schools and is still active within the area. Currently both the 3rd and 4th generation of family members are working to continue transporting the area children to school and other activities.